These are extremely serious issues. There is reasonable evidence of a possible link between power lines and childhood leukaemia, being generous, and we may not yet know the long-term physical risks posed by phones to those who use them, since mobiles haven’t been around too long (do send me a better reference than this for the “latent period” in epidemiology if you have one). I contacted Dr Coghill, since his work is now a matter of great public concern, and it is vital his evidence can be properly assessed. He was unable to give me the data. No paper has been published. He himself would not describe the work as a “study”. There are no statistics presented on it, and I cannot see the raw figures. In fact Dr Coghill tells me he has lost the figures. Despite its potentially massive public health importance, Dr Coghill is sadly unable to make his material assessable. This – if he truly believes his results – is a bit off. It also leads to obvious problems with interpretation: details are important, after all, like “what is your control group” or “which averages are you using”? Perhaps the average distance from a mast in any urban area is less than the average distance for the whole country, because masts tend to be clustered in urban areas, where the people are. Maybe densely populated poor areas with less political influence have more masts foisted upon them by planning committees, and maybe these poor areas also have more suicides. Or maybe he is on to something? Clusters on maps have been the beginning of several interesting stories in epidemiology, including the Broad Street Pump. I asked Dr Coghill which “averages” he meant, but he did not tell me. Who is Dr Coghill? He says he doesn’t have a doctorate and that the Express made a mistake. Does he “sit on a government advisory committee on mobile radiation”? Sort of. Mr Coghill participates in something called Sage, a “stakeholder” group which discusses power cables (not mobile phones) and is run at the request of the Department of Health by RK Partnerships Ltd, who specialise in mediation, facilitation, and conflict resolution. People who campaign on stuff are rightly invited on to consultation panels run by the government, so that their concerns can be heard. Sadly, such participants seem to be misrepresented as government advisers with remarkable frequency. As an example of the kind of discussion you might find at SAGE, here is Mr Coghill’s contribution to their last document [pdf], in the section where people who disagree with the group can state their own views. “Whilst this first interim assessment is a welcome step, it contains three important omissions… the powerfully electro-protective effect of exogenous melatonin supplementation, particularly among the UK’s 20 million elderly population, and the adverse effects of EMFs on melatonin synthesis within the body have not been addressed.” Mr Coghill recently received £125,000 of angel investment for his business selling Asphalia melatonin pills. Readers worried by the front page story on Mr Coghill’s inaccessible research may have visited his website for more information. There they could buy his electromagnetic field protection equipment at competitive prices, and a £149 device called the Acousticom for “finding out if your home is being exposed to microwaves from e.g. cellphone masts”, as well as several other interesting products, including a magnet that makes wine taste nicer, and the “Mood Maker” treatment for impotence at just £22.32 including VAT (“the small unit discreetly attaches to your underwear… the Mood Maker will gently and gradually increase circulation in the pelvic area”). You might also enjoy his books, including Electrohealing, “using electric and magnetic fields for alleviative and curative ends”, and of course Atlantis: “a new look at the Plato legend with a grim conclusion re global warming and ozone depletion”. We should be glad that there are individuals out there with such esoteric views. We should respect and admire their tenacity and self-belief, if not their ability to provide us with actual data. But from the front page of a national newspaper, we might be able to expect something a little more robust. It doesnt matter a fig, actually, whether I am a doctor, vet, biologist or, like James Randi, a professional conjuror. He is also wrong to omit that I have a number of degrees from senior Universities (Cambridge, The University of Wales) and am a Chartered biologist, thereby persistently and harrassingly detracting from my credibility as a scientist. The number in question being “2”. I’m rather perplexed at his phrasing here. Is he terrified of making quantitative or mathematical statements? Seriously, I really would prefer people not to be rude to Mr Coghill. 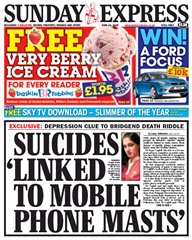 He is a serious research scientist who has performed a research study which found that all the Bridgend suicide cases lived closer than average to masts, and his worrying research findings were reported on the front cover of the Express. It would be wrong to dismiss these concerns and so I am eager to learn more about what he found in his study, which I understand was completed as long ago as February. Mr Coghill, could I start by asking what you used as the “average” distance you were comparing with? Ben, you say that Mr Coghill’s business interests and his failure to declare them are amusing but not the story. I beg to differ, over on CiF he accused a critic of being in the pay of the mobile phone industry (without evedence as far as I could see). If his critcs affiliations are important then so are his. Why does he assume that peoples views are bought? Can he imagine no other reason for having them. Mr Coghill, what value did you use as the average distance from a mobile phone mast and how did you calculate it? And finally the answer to the question of ‘average’. For anyone who’s wondering but doesn’t want to read the forum: he decided that the people were closer to masts “than average” by taking the total number of masts in the United Kingdom, the total surface area of the United Kingdom, and thereby calculating the number of masts per unit area. He then decided that half the distance between the masts was equal to the average distance from any person to a phone mast. He then took the mean of the distances between the suicides’ homes and the nearest mobile phone masts, and made his comparison. Of course, you could argue that his only mistake was failing to consider the uneven distribution of phone masts, but that’s just the start of where he went wrong. He forgot the human part when calculating his average distance to a phone mast. Humans are unevenly distributed too! In fact, humans and phone masts are heavily clustered together. His value completely fails to account for the great swathes of country with few people or phone masts to be found, which barely feature in the mean. Perhaps he should’ve used a different kind of average? In the interests of SCIENCE, I’ve done a quick back-of-the-envelope calculation like his, but instead of doing the entire country (which would be moronic, as discussed) I’ve elected to only use the surface area, population density, and cell phone mast density of Glasgow. In this way, we exclude areas of the country which have neither people nor mobile phone masts, and which therefore only exist to screw up the average. By my calculations, you are never more than three hundred metres from a mobile phone mast in that city, on average. A far cry from Mr. Coghill’s average, revealing the latter’s utter uselessness. Alas I don’t have the Top Secret Data For Bridgend so someone else will have to do the maths for there to confirm, but I suspect it’ll say what we’ve come to expect given Coghill’s evasiveness. Even the most basic bit of forethought or hindsight would’ve revealed this mistake. It’s apalling. Hmm, I borked that, but I think you can all see where (ZOMG transparency in research). The average “plot” per phone mast is about 0.3km^2, which if they were all circular (they wouldn’t tesselate, but I’m cludging here) would mean each mast has about a 300m radius around it which is clear of masts. However that means there may be a mere 300m spacing between masts, or in other words you’re at best 150m away from any given mast at any given time. I just did the maths, and based on council estimates, the population density of Bridgend is nearly equal to that of Glasgow, with about 300m2 per person, or 10m between people. So I expect that the cellphone mast density will probably be pretty similar. For Mr. Coghill’s estimate to be correct, Bridgenders would have to get by on one tenth of the cellphone infrastructure that Glasgwegians use. Maybe they’re just not very talkative, or they don’t mind having gigantic blackspots? Each mast in Glasgow, if evenly distributed in the city, would have a plot 0.3km^2 around it. If the plots were hexagonal (to allow tesselation in my mental model while approximating uniformity) that would be hexagons 340m on the side, so for someone walking the perimeters of the hexagons that’s a distance of about 300 to 340m from the mast at any given time. This seems to me a reasonable measure of the maximum distance you could be from a phone mast, on average. It’s also surprisingly close to the suicides’ distances, and about a third of Mr. Coghill’s esimate. As we’ve established, Bridgend has about the same population density as Glasgow, so we may expect the same cellphone tower density. 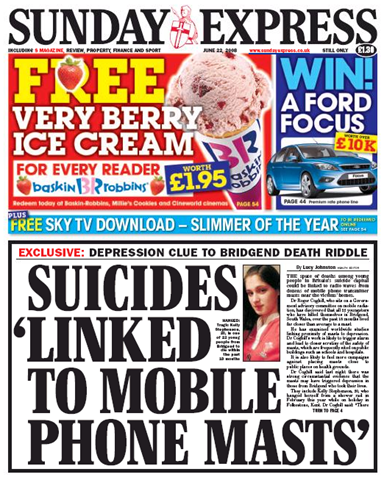 Unless Bridgend’s remarkably patchy, then it appears that the suicides were actually further from mobile phone masts than average. You seem to be comparing yourself to John Snow – one of the first people to apply spatial analysis to disease. If you would like to emulate his methods, perhaps you could provide a map of masts, houses and suicides (using one of the many available methods to anonymise addresses) to give us a sense of the distribution of suicides? If the suicides really are as obviously clustered as you claim, then we should all be able to see it, without any of us needing any maths. Of course, testing the significance of the clustering would need a little bit of effort, but any halfway decent Geographic Information System software would have all the tools to do it for you. Can I be the first to congratulate Sockatume? Not only have you offered a more useful calculation of the average, but you have nicely demonstrated that sharing your methods – and, where necessary, changes and corrections to your methods – is as important as the numerical answers. By the way, Sockatume, would you mind me using your working (and the source of your numbers, if you could share them) for my classes? One group did spot the error in the original ‘average’ as described by Mr Coghill, but then I have been trying to train them, with varying success, in the scientific method and logical reasoning. It’s not really the proximity of actual masts that’s surely important but exposure to the radio waves. In areas with a higher density of masts they will be operating at lower power levels than in less densely “masted” areas. So pervasively a higher mast density might actual work against Mr. Coghill’s hypothesis. Ian H: Sure, it’s not like a special method I invented. 😉 I think a few dozen people on the forum did the same sort of calculation anyway. It might be a fun exercise to see how the distance from the centre to the perimeter of each plot converges to a single value for tesselating shapes with increasing numbers of sides: triangles, squares, hexagons… by extrapolation you could maybe get the circumference for an idealised circular plot, although the circle does not tesselate and therefore this method would not work directly. While I don’t have a solid chain of reasoning, intuitively I suspect that this centre-perimeter distance for the plot is equal to the average distance from any point to the nearest mast, and not just the furthest possible distance you can be from a mast. For any given point, there are at most three neighbouring masts, forming an equilateral triangle. So the proof of this would involve demonstrating that the average of the distances from a point inside an equilateral triange to each vertex is a constant equal to some constant regardless of the position of the point. Oh, the sources of my numbers were just Wikipedia (population and surface area), visionofbritain.org.uk (population density) and the area totals on sitefinder.ofcom.org.uk. Note that I’m not sure that the areas summed for the City of Glasgow on sitefinder.ofcom.org.uk and Wikipedia’s area for the City of Glasgow are equal, but they should be close enough for this exercise. I know exactly where my local mobile phone ‘mast’ is, in Caversham, Reading (north of the river). It’s on top of the phone exchange, which I can see out of my kitchen window – the roof is littered with aerials. It’s 114m away in a straight line, according to www.samknows.com/broadband. (Enter RG4 7SH as the postcode.) I’m not even the closest residence to this. I’m not aware of lower Caversham being a hotspot of suicides. Wow. This is extraordinary. This thread, along with the jaw-dropping content on CiF, has compelled me to sign up to badscience.net to add a post. Mr Coghill: What on EARTH are you doing? I have sat here and watched, in disbelief, your reputation dissolving as the threads progress. It is true that criticism of you and your position has become increasingly vicious and personal from some posters, which is a shame because this is an important debate. However, this is entirely of your making. You have provoked, provoked and provoked some more, in what can only be described as an ill-considered battle of words and will. You yourself have dismantled your credibility. Why? It is clear that, for reasons known only to you, you will not be revealing any pertinent information about your study. Shame. Perhaps I may try asking you a different question: Why do you see fit to treat the general public with such contempt? The headline published by the Sunday Express surely has the capacity to have a profound affect on some people? There could well be people who, as I write, are considering moving house, away from a mast, based on that headline. Uncertainty playing on their minds. Under current economic conditions, considering such a move must be incredibly stressful. Would you sympathise with someone in this position? Can you, through this forum, help them to understand this headline better? You have been given the opportunity to back-up your claims in a way that is beneficial to all involved, including yourself, and you have chosen, bizaarly, not to. You have said yourself, in these threads, that you wish to bring the issues you are passionate about to the public, to try to urge authorities to take action. You see yourself as a modern-day John Snow. Do you not realise that your behaviour here has surely blown your chances? To succeed one must look after their reputation. I’d be more than happy to spend a couple of weeks collaborating in research with you around Bridgend. I’ve recently graduated in Psychology, so I’ve a reasonable understanding of research methods in the field. My family live in Bridgend, I’m about the same age as some of those who have died, so I’ve local knowledge. I don’t need paying, I’d be interested to do it for the experience, and I can work out my parent’s shed. It’d probably take me a while to arrange access to a spectrum analyser, I’d have left the area by then, but if you can lend me one I could probably sort out a deposit or something, and I’ve family in Bridgend who know how to use them so I’d be more than happy to wander round for a couple of weeks and take some actual measurements for you. I’m fairly used to handling tricky electronic equipment. I am completely serious about this. I realise I’m not a national newspaper columnist and my name isn’t going to provide instant credibility, but on the other hand I have got a few weeks to spare and I am on the ground. If you are interested bung me an email, brainquack at gmail dot com. 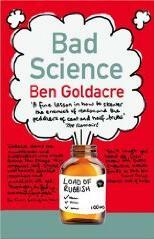 Incidentally, longtime readers of the “Bad Science” column have seen other researchers’ work heavily criticised in the media and ultimately shown to be right in the first place, or more-or-less, and have been able to observe, through public statements (which it is best to make few of, except in the course of a back-and-forth discussion, but make them count), how those researchers conduct themselves – the question of “grace under pressure” is one way to put it. On the other hand, many of those have a full-time salary and can afford to wait for truth to come out in the end, which is different to running a business, where your income depends immediately on your credible reputation. It is true that much money is spent on health information, but is also true that so far not found a cure for terrible diseases and quickly spread throughout the body, it calls on the authorities to have a better distribution of this money because it costs so far in vain, I have friends who suffer from cancer, HIV, Alzheimer’s, and so far we can not find any solution to the disease, only control their pain medication, but even when taken the same? will actually one day cure? please you have to be sensible and remember that no one is free of disease and therefore it is important for everyone, it is important to reflect on the subject and provide information on www.wikipedia.com, www.findrxonline.com, www.cheaponmeds.com Web differentiated have good information that can help many people in the world. Looking back, WuWen CHI Flat Iron stood on the side, even they were so bright flowers in spring, the heart is full of fun.